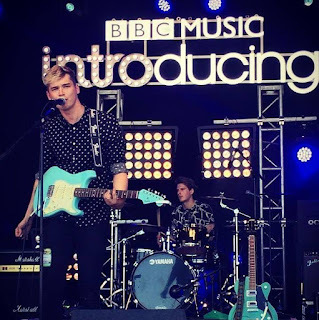 Jordan Allen and his band have enjoyed a massive surge in popularity in 2016, topped off by a performance on BBC's Introducing stage at both Reading and Leeds festivals. They've just released a new single Dancing In The Dark and are playing Ramsbottom Festival on Sunday. We caught up with Jordan to find out more about the crazy year he's had to date. First of all, congratulations on getting the slot at Reading and Leeds recently. How did it feel stepping out at such a prestigious festival and fulfilling one of your dreams? Thanks very much! It was a bit crazy really. To be honest once we walked out on stage it was just like any other gig, it wasn't really until we sat down in our tents after we'd played Leeds and thought "Wow that was pretty mental wasn't it?" The crowds at both were great and really responsive. Have there been any other major highlights this year as your profile seems to have sky-rocketed? The last twelve months have just been one big blur. Going to record at Real World Studios and working with Steve Osborne is something I'll remember for the rest of my life. It really changed the way I think about writing too, I learnt so much. Then some of the gigs like having people queuing down the road for our Dot to Dot set at The Castle and our headline show at the Ruby Lounge the week before Reading and Leeds which just went off, filming videos in London. I honestly just try not to think about it and keep my head down, because there is such a long way to go yet. Could you tell us a little about your new single Dancing In The Dark? When we finished the sessions down in Bath this was the track we were most confident with. I wrote the riff in my back garden on a proper sunny day in 2015 and I remember that I had wanted to write a song about flirting and that's what this one is all about really. I just think it's a really interesting interaction, and one I've always been terrible at so it intrigues me when people are good at it. The video is interesting too, a mix of live footage and the band fooling around and it captures perfectly the essence of a live Jordan Allen show. Was that the plan? Haha I wanted a wacky video, I thought the first two were brilliant artistic pieces, but I wanted something a bit more loose cut, so I rang Kallum (RKid Media) and told him I wanted something gritty, dirty and funny. He said "you rang the right bloke" and we shot it that same week. It's shot in The Live Room on Grosvenor Street where we played a crazy gig earlier this year, we wanted to recreate that with people in fancy dress and let it get out of hand. Along with Helter Skelter and Too Much Too Soon you've been quite prolific in the last few months with new songs. Are there plenty more ready and waiting to be unveiled and will we still see some of the old favourites? Indeed we have two more recorded, but next week we head back into the studio to crack on with a new track that went down a storm at Reading and Leeds called Rosie. I've also written 11 more so we're really not short of material, it's just about finding the time between gigs to translate them into full band pieces. I really want to re-record some of the old stuff at some point however one or two of them may have to get faded out of our live set unfortunately. You're playing Ramsbottom Festival this weekend - which is probably the closest you'll get to a hometown one of this size. Are you excited and will you have a lot of your mates there to support you? We've got lots of people coming to see us I believe it should be ace if we get the weather, I played the Chocolate Festival there once four years ago. It snowed, I had no microphone and I had to play for two hours because hardly any artists turned up. So I have every confidence it'll be better than that! What are your plans for the rest of 2016 and into 2017? We've got Milecastle Festival up in Carlisle next then Neighbourhood in Manchester which we're really excited about then our first headline show in Liverpool on Saturday the 15th October at Buyers Club after that we've got even more shows to announce so exciting times ahead! Hopefully next summer we can hit every date on that festival circuit. We're also planning to press on with getting more material out there. Hopefully the next instalment will come before the year is out. Jordan Allen's official website can be found here and he is on Facebook and Twitter.